Here's another example of why going digital enables backup safety that single originals can't achieve. - Ask Leo! 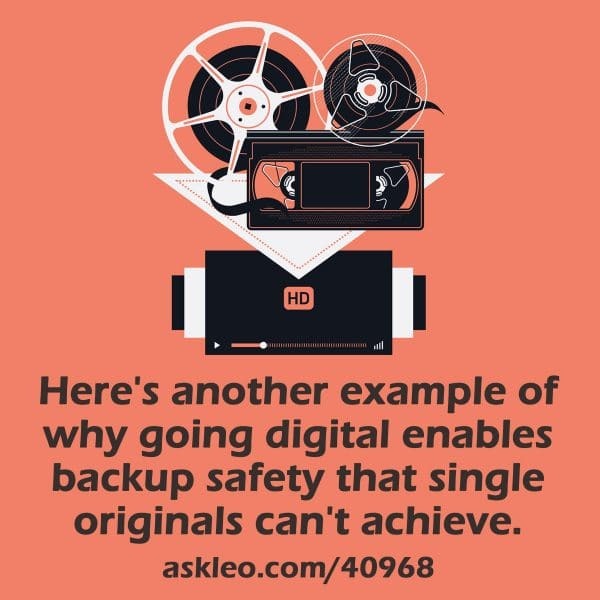 Here’s another example of why going digital enables backup safety that single originals can’t achieve. Creating a Backup Image Using Windows’ Built-in Backup - I don't think much of Windows' backup utility--but any backup is better than no backup. Let's take a look at how to use it. Restoring an Image Backup Using Windows 10’s Built-In Backup - We've backed up an image, and we've created our recovery drive -- it's time to restore an image using Windows 10's built-in backup program. To access this post, you must purchase Just Do This: Back Up (PDF). What’s the Difference Between an Image Backup and a Files and Folder Backup? - These two settings help you decide what you are backing up on your computer. That decision can be the difference between an easy or difficult recovery. « Previous post: Online document conversion services can be safe, or they can represent a real privacy risk.